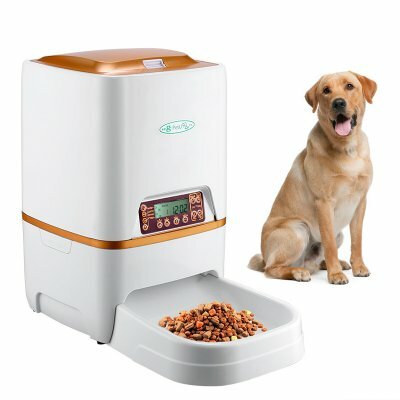 Successfully Added Automatic Pet Feeder - For Dry Food, 6L Capacity, Voice Record, Adjust Serving Size, Durable ABS Design to your Shopping Cart. This automatic pet feeder is capable of feeding your beloved dog or cat without you needing to be physically present. Simply insert the daily feeding times, fill up the machine, and your automatic food dispenser will do the rest. From now on, you can be assured that your furry friend can always enjoy a full bowl of food at the right time of the day. This makes the automatic pet feeder the perfect accessory for those of you that have a busy schedule and occasionally come home late from work. With this pet electronic gadget, you’re able to feed your pets even when you’re not around. Your automatic pet feeder comes with a large barrel that features a capacity of 6L. This allows you to fill it up with enough dry pet food to feed your cat or dog for numerous times. Thanks to this, you won’t have to worry every day about refilling your pet’s food dispenser. You can use this smart home gadget with dry foods measuring 0.5 to 1.5cm in diameter. Each serving can contain between 10 to 390 grams of pet food. You’ll be able to manually adjust the size of each serving to make sure that it is fully optimized for the needs of your cat or dog. Another fun little feature this automatic pet feeder supports is its voice record and play. This allows you to record a message for your pet that will be played at feeding time. Like this, your dog will actually feel as if you’re around and are calling them to say their food is ready. It comes with a simple design that can be easily programmed. Thanks to this, anybody is able to set it up in no time. This automatic feeder brings along high efficiency for all pet owners out there. From now on, you’ll never have to worry again about your cat or dog being hungry when you come home late from work. This pet feeder comes with a 12 months warranty, brought to you by the leader in electronic devices as well as wholesale electronic gadgets..